We are a network of individuals, families and groups working together to the see the Great Commission accomplished. Welcome to Autumn Rain International. We are a network of individuals, families and groups working together to see the Great Commission accomplished. Freedom to worship God is forbidden in many countries around the world today. 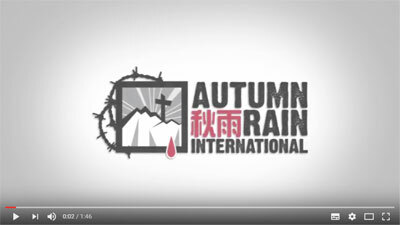 Autumn Rain International connects with believers in places where there is opposition to Christianity, to find out their needs and supply them according to their request. Asia is an incredible harvest field. Autumn Rain International is privileged to partner with national pastors, evangelists and missionaries who are reaching their own people in significant ways. By linking them with the resources of developed counties, together we can become a stronger and healthier body. Few people in the West know these pastor and evangelists, they are the unsung heroes of the Gospel story, who are standing for Christ in places where persecution and poverty are current issues. They are ordinary people who are doing extra ordinary things in near impossible circumstances, worshiping the God who makes all things possible – even in places where such worship is a crime. They need our help. For the sake of our own spiritual health, we need them as much as they need us. We cross borders, bridge political divides, span social-economic barriers, and push aside apathy to reach these people, to stand in solidarity with them for the sake of the Gospel.